Product prices and availability are accurate as of 2019-04-08 12:03:55 UTC and are subject to change. Any price and availability information displayed on http://www.amazon.com/ at the time of purchase will apply to the purchase of this product. What is Tri-Ply stainless steel construction? 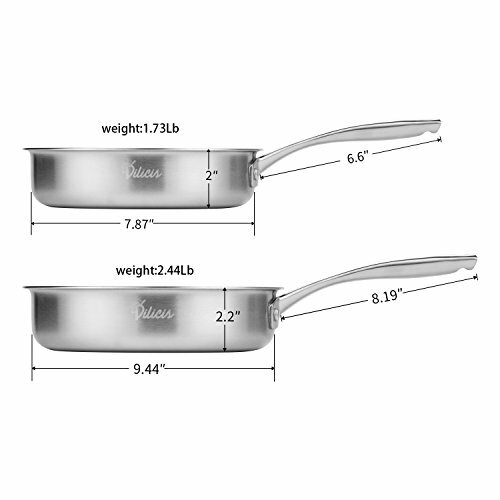 1.Inner layer : food grade 18/10 stainless steel interior for healthy cooking. 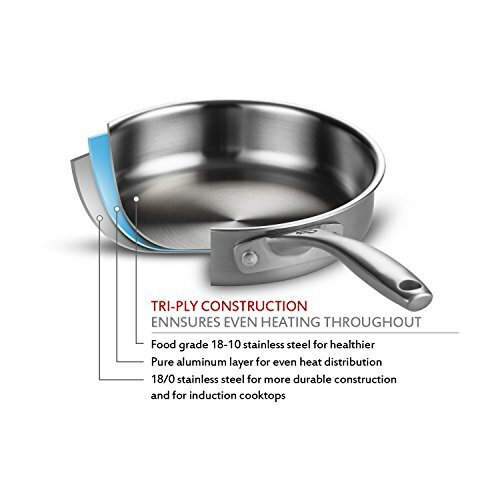 2.Middle layer : aluminum core inside the cookware for even heat distribution. 3.Outer layer : 18/0 stainless steel for more durable construction and faster thermal conduction. 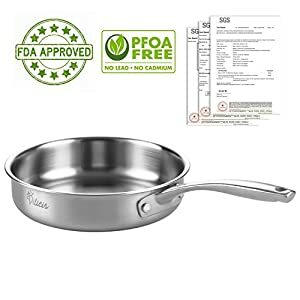 4.Physical non-stick : tri-Ply stainless steel construction reduces the friction between foods and pan so as to make it easier to separate objects, that is what we call physical non-stick. 5.Designed in USA : durable handle is designed ergonomically for more easy holding and more comfortable ; pouring rims design to avoid scraping your hand. Why FDA-Approved cookware is more healthier? 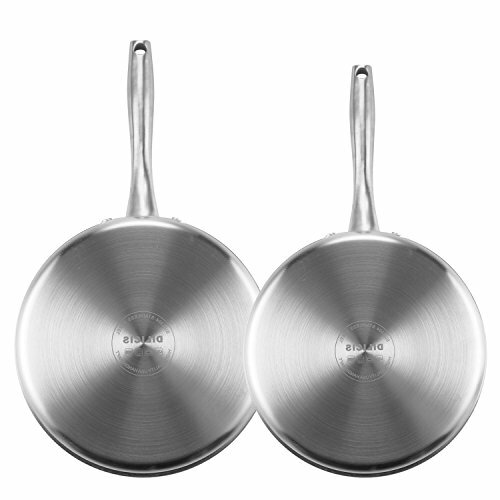 Dilicis cookware has been tested by SGS and it is recognized as safe (GRAS) specifications in stainless steel. 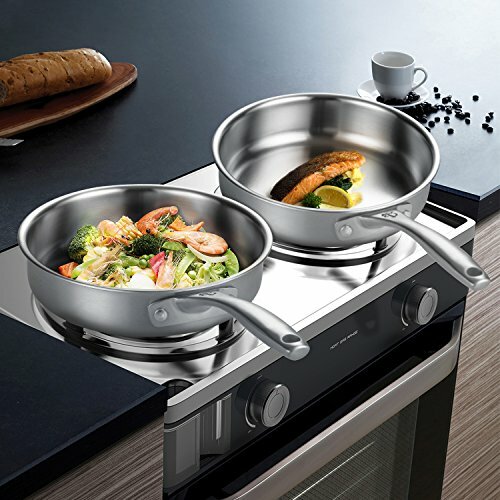 While cooking food, these pans would not precipitate harmful substances even for years using. And this is what other coated non-stick pans can't do because the non-stick coating is easily destroyed after a period of use. Once the non-stick coating is destroyed, foods will directly contact with the original bottom which is harmful. How to use the professional fry pan better? 1.Wash the pan with hot water before using. 2.Pre-heat the pan with medium to low heat for 1-2 minutes. 3.Add some oil or butter so that the base is covered. Heat the oil gently and turn the pan to coat the inner side walls. Then begin cooking as normal. 4.For optimal cooking performance, low to medium heat settings are recommended. A high heat setting would be used for boiling, otherwise overheating can cause brown or blue stains. 5.Finish cooking, cool the pan for a few minutes by natural. Do not fill hot pans with cold water. 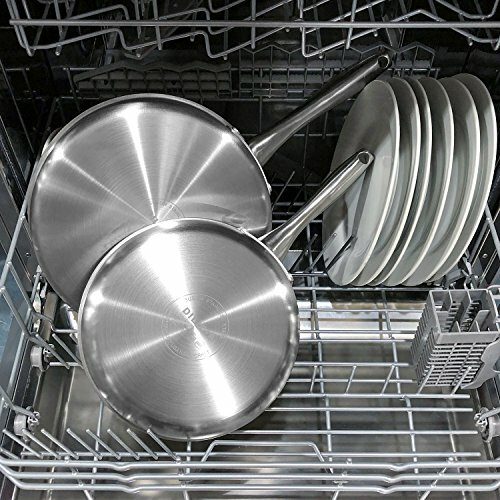 After cooling, washing in hot soapy water, rinse with soft pads or brushes for removing stubborn residues, then dry thoroughly or clean in the dishwasher. SET INCLUDES : 8-inch fry pan (net weight 1.73lb/inner depth 2"/inner diameter 7.87"/handle length 6.6"); 10-inch fry pan (net weight 2.44lb/inner depth 2.2"/inner diameter 9.44"/handle length 8.19") DESIGNED IN USA : Tri-Ply bonded construction consists of food grade 18/10 stainless steel as inner layer which is directly in contact with food, aluminum as middle layer provides even heating for excellent, and 18/0 stainless steel as outer layer for faster thermal conduction. Ergonomically designed handles for comfort and safety. Pouring rims design is more helpful in cooking. FDA APPROVED : US FDA generally recognized as safe (GRAS) specifications in stainless steel. This is very important for your health. Its material is 100% Safe and Eco-friendly as PTFE/PFOA/Cadmium/Lead free SUITABLE FOR : all kinds of cooktops including gas, electric, ceramic glass, induction, halogen. Dishwasher safe. Oven-safe up to 500F / 260C. LIFETIME WARRANTY : from the date of purchasing, this warranty guarantees replacement at no charge of any piece of product showing defects in material or workmanship under normal use following the use and care instructions. Design in USA, made in China.